Guys, looking for something to do in Cody on Saturday November 17th, while the gals go shopping? Come check out the big boy toys at Mountain Valley Motorsports open house. We're having a spectacular event with unbelivable pricing, great rebates, cash back, added accessories and low 2.9% financing. 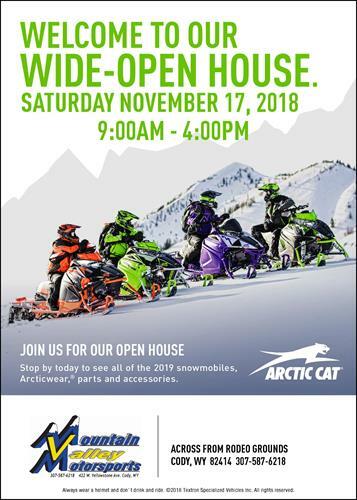 All the 2017, 2018, 2019 Arctic Cat snowmobiles and Textron ATV's and Side X Side's including Mountain Cat snowmobiles up to $2500 rebates, Alterra ATV's up to $1000 off, Stampede and Wildcat Side X Sides up to $2500 in rebates. Drawing for super cool man cave signs and door prizes, barbeque and beverages all day long.